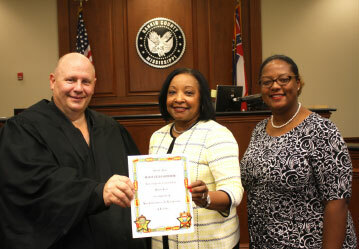 Rankin County’s first Family Reunification Day celebration included a courtroom ceremony followed by a picnic. 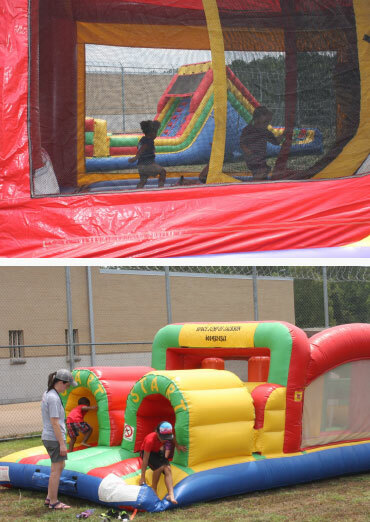 Nine families, totaling about 25 people including children, ate hamburgers and hotdogs and mingled with Child Protection Services workers, Youth Court staff, local law enforcement officers and other local officials. Things didn’t start out on such a cheerful note for these parents who landed in Youth Court facing allegations of child neglect. “It’s been three years, a long and difficult journey,” one young mother told those assembled for the courtroom ceremony. “I was rebellious. I didn’t know which direction to go. I am happy they have pushed me to be the mom that I’ve become. I just needed that push.” She regained custody of her son. Rankin County Youth Court Judge Tom Broome picked up the child and let him hold the gavel. Although children are placed in foster care temporarily due to allegations of abuse and neglect, the goal of Youth Court and Child Protection Services is reunification of children with parents if parents are able to show that they can provide a safe and nurturing home. Parent attorneys, Child Protection Services, the Youth Court, guardians ad litem and Region 8 Mental Health have worked with parents to make changes in their homes and lifestyles so that children may return to their families. Rankin County has seen a 49 percent reduction in children in foster care during the past year, Chief Justice Bill Waller Jr. said in a recent letter to the Rankin County Board of Supervisors. The letter was presented at the July 2 Board meeting. Judge Broome attributed part of the decrease to the advocacy of attorneys who represent the parents, “giving families a voice in the courtroom that they might not have had before.” Rankin County was among the first three counties participating in a pilot program that began in 2012 to provide indigent parents with attorneys. “When they (parents) feel like they are a part of the process, it makes a difference in the outcomes for those families,” said Carlyn Hicks, who served as the parent representation attorney for indigent parents in Rankin County for nearly six years, working for Mission First Legal Aid. Hicks said the program takes a holistic approach, advocating for the parents in court and helping them find other services that they need. Hicks is now director of of Mississippi College School of Law and Mission First. Corey Gerber recently became the program’s parent representation attorney for Rankin County. Hicks and Gerber were among eight recipients of Hero Awards presented at the Reunification Celebration. Other Hero Award recipients recognized for their hard work with families were Child Protection Services Supervisors Danielle Armistad and Cynthia Moore, CPS Family Specialists Shannon Lewis and Tiffany Robinson, and Guardians ad Litem Linda Martin and Ann Moore. Mission First was also recognized as a Reunification Superhero.